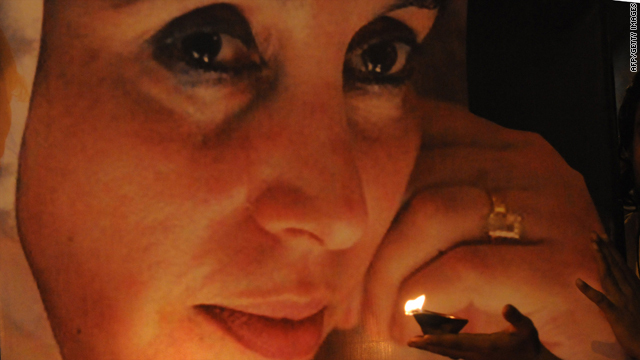 Activists and supporters of the Pakistan People's Party light candles in front of a portrait of Bhutto in Karachi in 2009. United Nations (CNN) -- Pakistan's military-led former government failed to protect former Prime Minister Benazir Bhutto before her 2007 assassination, and intelligence agencies hindered the subsequent investigation, a U.N. commission concluded in a report released Thursday. The three-member investigative panel issued a scathing report Thursday afternoon, concluding that the suicide bombing that killed Bhutto "could have been prevented" and that police deliberately failed to pursue an effective investigation into the killings. Bhutto had returned from a self-imposed, eight-year exile to run in the country's general elections two months before her assassination and already had escaped one attempt on her life. She was killed in December 2007 by a 15-year-old suicide bomber while campaigning in the Pakistani city of Rawalpindi, the seat of the country's military. "No one believes that this boy acted alone," the report states. "A range of government officials failed profoundly in their efforts first to protect Ms. Bhutto, and second to investigate with vigor all those responsible for her murder, not only in the execution of the attack, but also in its conception, planning and financing." A spokesman for then-President Pervez Musharraf said Friday the government offered adequate protection for Bhutto. "I believe the government at the time did whatever they thought was reasonable," said Muhammad Ali Saif, a spokesman and adviser to the former president. "It was repeatedly stressed [to Bhutto] that she should be careful because of numerous credible threats against her," the spokesman said. "Unfortunately, she did not heed these requests, and she went ahead and took part in the procession. The government did take whatever reasonable measures to protect her. "There's no prescribed standard for maximum or minimum security. The very fact that she deemed it necessary go to a public meeting shows that she herself was satisfied with the level of security the government provided." Pakistan's government and the CIA blamed the killing on Baitullah Mehsud, a top Pakistani Taliban leader with ties to al Qaeda. Mehsud was killed last year in a suspected U.S. drone strike. While Thursday's report did not identify a particular culprit, it found that police failed to preserve evidence at the scene of the bombing and said the investigation "suffered from a lack of commitment to identify and bring all of the perpetrators to justice." In particular, the "pervasive reach" of Pakistan's intelligence agencies left police "unsure of how vigorously they ought to pursue actions, which they knew, as professionals, they should have taken," the report states. The current Pakistani government, led by Bhutto's husband, Asif Ali Zardari also responded to the report. "The U.N. Commission has meticulously identified the criminal attitude of the previous dictatorial regime that led to Mohtarma Benzazir Bhutto's assassination," said Farahnaz Ispahani, a media adviser to the president. "Mohtarma and President Asif Ali Zardari's position [have] been vindicated. This report will pave the way for a proper police investigation and possible penal proceedings." Another spokesman, Farhatullah Babar, said the U.N report will "lend speed and strength to the domestic investigation that is ongoing." The U.N. commission's chairman, Chilean U.N. Ambassador Heraldo Munoz, said the panel's role was "fact-finding" and not prosecutorial. Asked whether the failure to protect Bhutto was deliberate, he said, "it is not up to us to make inferences." But he added, "It is clear that warnings were passed on, on various occasions, and Ms. Bhutto received also information in this regard from outside Pakistan. "Nevertheless, what we have found is that the passing of information was not accompanied by commensurate measures to protect her, particularly given the fact that an assassination attempt had been made against her the very day she returned to Karachi, [Pakistan]," he said. Nationwide polls conducted shortly after Bhutto's death found that a majority of Pakistanis believed Musharraf's government was complicit in the assassination. Bhutto's supporters took to the streets after her killing. The ensuing riots left 58 dead and more than $200 million in property damage. Bhutto's return to Pakistan came amid a struggle between the country's political leaders and Musharraf, who seized power in a 1999 coup. At the same time, the country was besieged by a surge of attacks by Islamic extremists. Her first night back in her homeland, a pair of bombs went off near her armored truck, killing 149 people and wounding more than 400. Further heightening tensions, Musharraf declared a state of emergency in November 2007, suspending the constitution, sacking the country's chief justice for a second time and imposing what amounted to martial law. Thursday's report criticized the influence of Pakistan's intelligence agencies in the country's government, including efforts to influence elections and the courts. "This pervasive involvement of intelligence agencies in diverse spheres, which is an open secret, has undermined the rule of law, distorted civilian-military relations and weakened some political and law enforcement institutions," the report states. "At the same time, it has contributed to widespread public distrust in those institutions and fed a generalized political culture that thrives on competing conspiracy theories." Bhutto's Pakistan Peoples Party went on to win the most number of seats in elections held in 2008, and Musharraf resigned. Zardari asked the United Nations to look into his wife's death after taking office, and he was one of the more than 250 people interviewed by the commission. Bhutto faced threats from "a number of sources," including al Qaeda, the Taliban and local Islamic militants and "potentially" from Pakistan's ruling establishment, the report states. Two months before her death, she wrote a letter to Musharraf that identified three people she considered threats to her safety. But Pakistan's investigation failed to investigate Mehsud, al Qaeda or other organizations that might have been involved, according to the U.N. report. "Investigators also dismissed the possibility of involvement by elements of the establishment, including the three persons identified by Ms. Bhutto as threats to her in her 16 October 2007 letter to Gen. Musharraf," the report states. U.N. officials said the question of whether to reopen a criminal investigation into Bhutto's assassination now lies with Pakistan. "We cannot accuse or absolve anyone," Munoz said. "That is not our task. That is the task of the competent authorities in Pakistan." CNN's Joe Vaccarello at the United Nations and Reza Sayah in Islamabad, Pakistan, contributed to this report.